“We don’t want to build Future Fit on fear.” Can we realise the #myfuturefit dream for reorganising Shropshire’s health? Of course we don’t want to build Future Fit, a new model for health provision in our area, on fear. But in my view, Future Fit is flawed because it is more theoretical than grounded in the reality of Shropshire’s geography and because I doubt it can be funded. Yesterday, the Future Fit team held its last major workshop on the future of health provision in Shropshire, Telford and Wrekin and Powys. The event in Ludlow Assembly Rooms was attended by more than 100 people. As this stage, the discussion is about issues and options. It’s about getting reaction to a set of top down proposals for radical reorganisation of health services including A&E, planned surgery, Minor Injury Units and community hospitals. The scheme is ambitious and I question whether it is achievable. There will be more care at home and perhaps in GP surgeries – but I did not gain the impression that GPs have been closely involved in this or think they can cope. I heard no mention of carers. The Future Fit model centralises all major operations and significant care needs. It may even lead to a new A&E allied with an Urgent Care Centre midway between Shrewsbury and Telford. Before I talk more about the options, first let me give a voice to the Future Fit team who have put a lot of effort into these consultations. So what is the Future Fit model? What are these champions of a remodelled health service trying to create? And why is it so controversial? DTC: Diagnostic and Treatment Centre. There will be one of these, possibly located alongside the Emergency Centre. It will deal with planned surgery. This will mean an end to planned operations that are cancelled because of urgent demands from A&E. LPC: Local Planned Care Services. These services will deal with diagnosis, assessment and follow-up, including tele-consultation with specialists. They will not be stand alone facilities, but attached to UCCs or other health facilities. CU: Community Units. These will deal with higher acuity than current community hospitals. They will help stabilise and rehabilitate patients. They will probably be located with other facilities and it is not clear how many there will be. HH: Health Hubs. These seem to be about community empowerment in health, “localised but consistent services.” I am not quite clear what these hubs are or why they are different from what GPs currently provide. To these six levels of facility we must add GP services, and tertiary specialist hospitals such as Robert Jones at Gobowen. It’s a pretty complex system, isn’t it? That’s one of my major concerns about Future Fit. It seems to assume that we can impose a theoretical model regardless of current provision and infrastructure. We can’t. We have superb facilities we must keep and valued locations where we must maintain a service. The proposal for a new Emergency Centre (A&E) and UCC site is not viable. It is purely a fudge to prevent the location becoming a political battleground in the run up to the 2015 general election. There is never going to be enough money to build a new facility and it will be unwise to blow any available money on a new site. The new EC it will be located at RSH in Shrewsbury or PRH in Telford. Many people at the meeting thought it will inevitably be in Telford, a hugely difficult place to access by public transport if you live in this part of the county. We were told that you get better care in bigger facilities (we don’t seem to call them hospitals any more). “If care is dispersed,” GP and Future Fit clinical designer Bill Gowans told us, “It is more costly and less good.” I accept that, but if your condition deteriorates or you die on the way to hospital, that better care will be negated. Bill told BBC Radio Shropshire this morning that it is “people that matter not buildings.” That’s right but getting the right locations for treatment is also vitally important. Access is the critical issue in this rural county. If you live in Bishop’s Castle, have to wait for a blue light ambulance to come from Craven Arms and then get taken to PRH at Telford, that’s a 46-mile trip on lousy roads. Then your friends and relatives need to travel on a nearly 100-mile round trip to see you. To go from my house in Ludlow to PRH, I need to catch two buses and two trains. Distance to medical assistance is a crucial factor in health outcomes and excessive distances discourage people from engaging with health services. 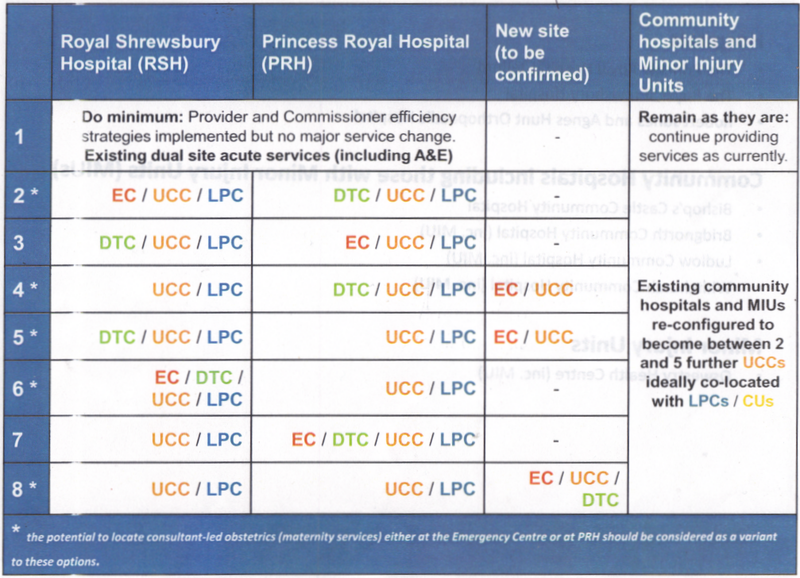 So will we get our community hospital in Ludlow upgraded to an Urgent Care Centre? Carol Morton told us: “The south of the county will have a UCC. Will it have 2 or 3? I can’t say.” That sounds to me like there will only be one UCC in the south, denying either Bishop’s Castle, Ludlow or Bridgnorth local urgent care facilities. If people have to travel long distances to a UCC, they’ll go to our already overloaded GPs instead. I am concerned that we heard little about GPs, nurses, community nurses and carers at this event. It is clear that they have not been forgotten, but if they are not central to the model they are in danger of being squeezed out the inevitable struggle for resources. I’m concerned about the bureaucracy too. We are a model with a least eight levels of health facility. This will be confusing and each part of the operation will need its own managers and administrators. The NHS already suffers from excess bureaucracy. Until questioned by the audience, we heard little about mental health. Bill Gowans told us “No health without mental health” is not just a slogan. The Future Fit team want mental health integrated alongside mental health. Yet, we had to prompt for answers on mental health and it doesn’t seem central to the model. Future Fit is hugely ambitious. It is prone to failure if three conditions cannot be met. Those conditions are making the best use of existing infrastructure; ensuring local provision across the county; and securing adequate financing. Yesterday’s workshop was well worth attending and I thank the Future Fit team for organising it. But I think it unfortunate that there were no young people present. It’s their future we are discussing. I am also not convinced that we discussed a system that is financially and operationally viable, or gives enough consideration to the south and rural parts of the county.